Last night, one of my dear friends from Duke undergrad, Jessie, and I cooked up a delicious salmon dinner together! 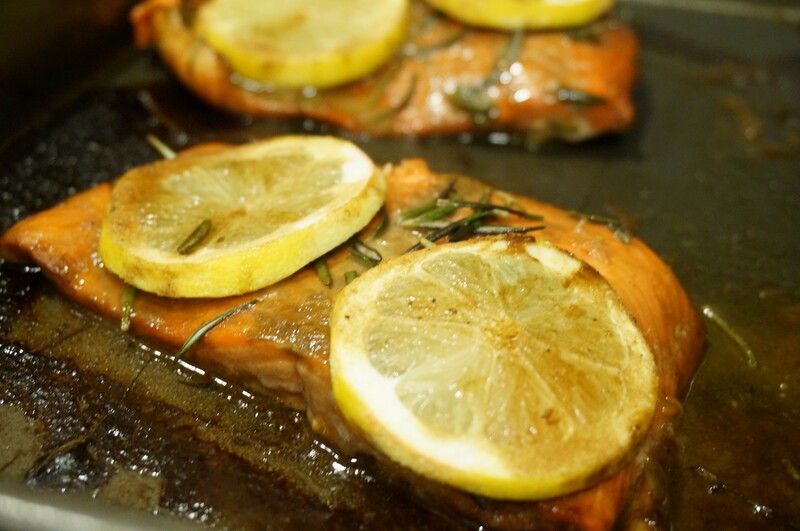 We decided on a balsamic marinated baked salmon, with hints of lemon and rosemary. Served over rosemary-garlic quinoa with a spinach salad on the side! It was the perfect meal for a busy week of class for both of us (she’s a med student at Duke now! ), and it was such a sweet time that we had just chatting in the kitchen (with our aprons on, of course) and sitting on big fluffy pillows by the fire. It was the coziest night I can remember in a while! The nice thing about this recipe is that it uses frozen salmon fillets that you can just take out of the freezer and thaw when you’re ready. The whole thing comes together in less than a half hour, since the salmon cooks so quickly. Next time, I think I’m going to try to broil it from completely frozen and see if that makes any difference in the texture. Feel free to play around with the spices- up, down, however you like. You could also completely toss the lemon balsamic idea and come up with your own marinade- I was originally going to do a honey teriyaki glaze (keep an eye out for a recipe coming soon!). As far as this one goes, I think next time I might use a tad less rosemary (I always get a little overzealous when it comes to fresh herbs) and perhaps a little more lemon to balance out the balsamic. Other than that, the marinade was delish! 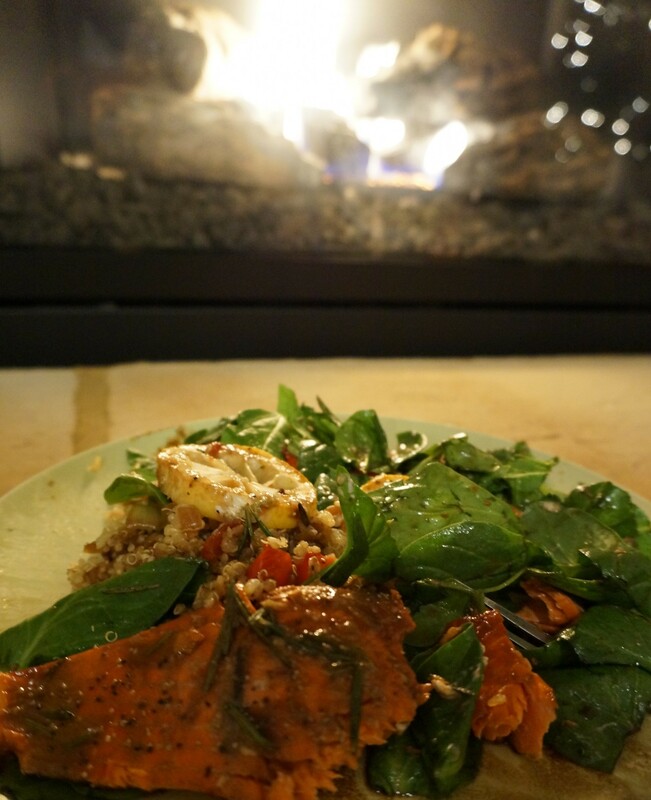 The flavor was just light enough to compliment the salmon, and the garlic and onions in the quinoa added the perfect amount of extra “spice.” And definitely make sure to have the strawberry and goat cheese spinach salad on the side! 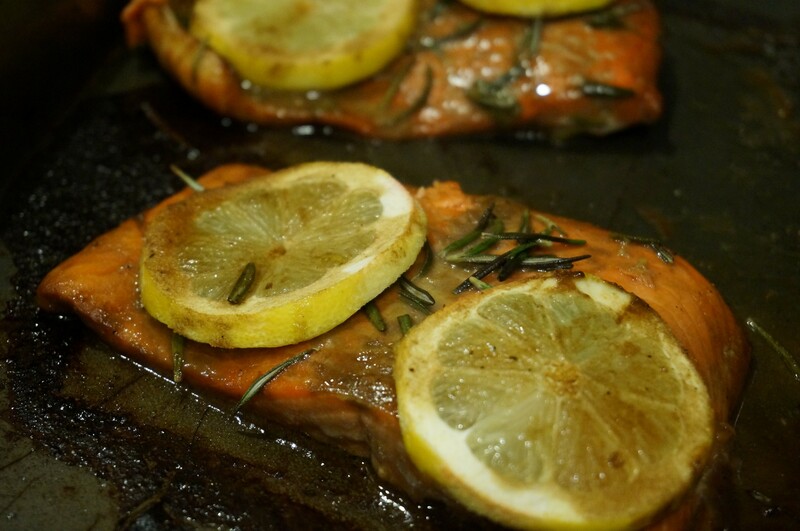 A simple, flavorful recipe for oven-baked salmon using fresh lemon and rosemary! Serve with my rosemary and garlic quinoa and a spinach salad on the side. Prepare a baking sheet by covering with foil and spraying generously with cooking spray or a bit of oil. In a small bowl or tupperware, combine vinegar, olive oil, Dijon, salt, pepper, garlic, rosemary, lemon zest, and lemon juice. Whisk together until smooth. Reserve about 1/3 of mixture for later (this will be the dressing for the salad!). Pour the remainder of the marinade into a large ziplock bag. Add the salmon and massage the marinade into both sides of the fish. Meanwhile, add olive oil to saute pan and turn heat to medium high. 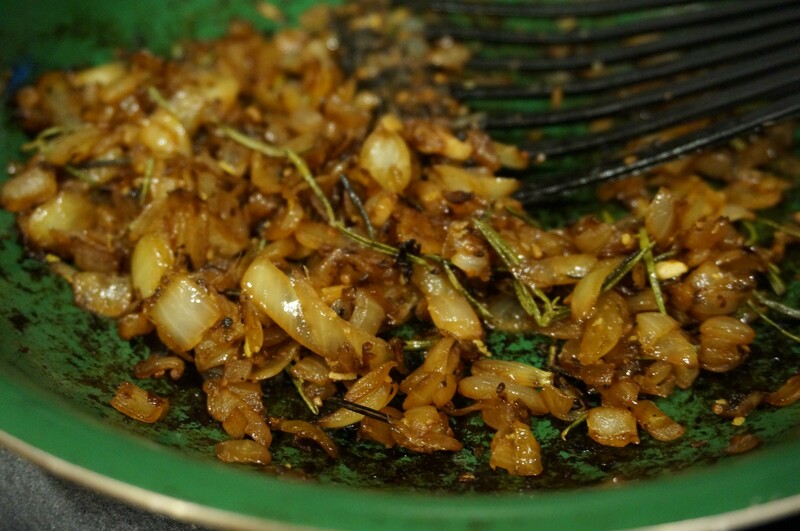 When pan is hot, add diced onion, 1 tbsp minced garlic, and 1 heaping tsp fresh, minced rosemary. Cook 3-5 minutes or until onion is soft. You can also add a bit more lemon zest, and some salt and pepper for extra flavor! Place salmon on prepared baking sheet and drizzle with a bit of the reserved marinade. Top each fillet with extra rosemary and two lemon slices. While salmon is baking, cook quinoa according to package directions. 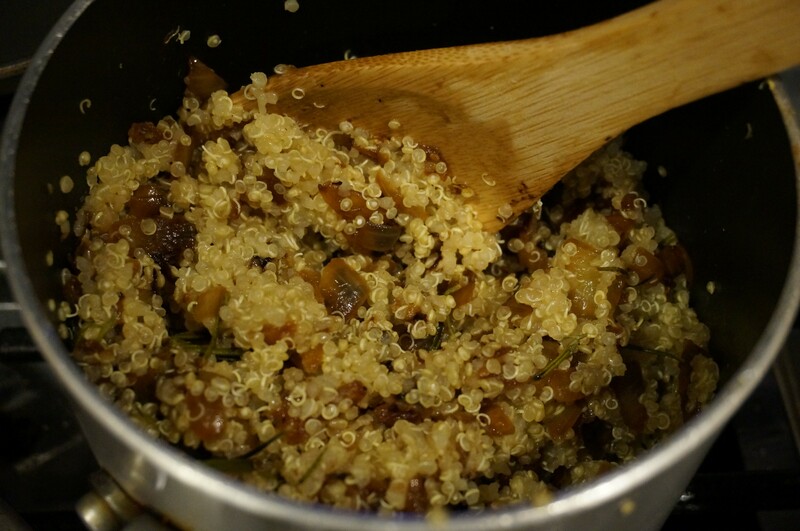 When quinoa is done, stir in the garlic and onion mixture. Turn heat to low to keep warm. Remove salmon from oven and serve over quinoa. 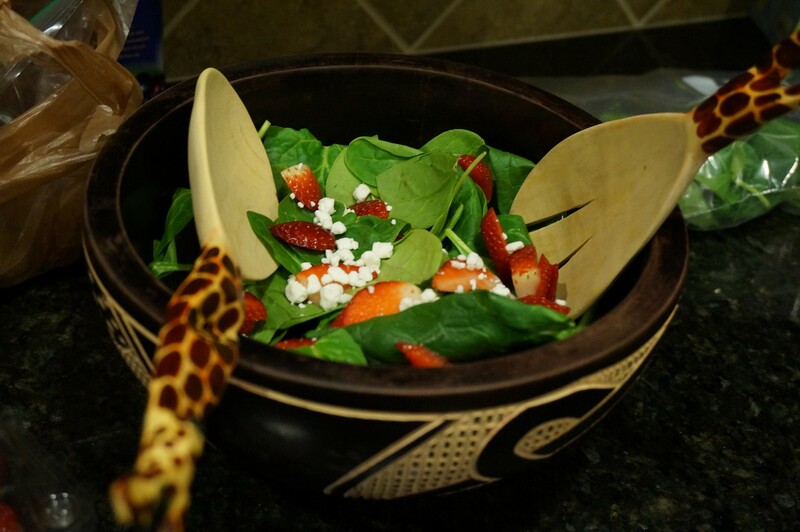 We also served with a spinach salad on the side: simply add spinach to a salad bowl and top with sliced strawberries and crumbled goat cheese! Drizzle with a bit of the reserved marinade for a tasty balsamic dressing. *Our salmon wasn’t completely thawed so we baked it for about 15 minutes, then broiled it on high for an additional 3 minutes!